I have never tried orange and blue together! they go so well!!! Lovely layout!beautiful colors and pictures!thanks for sharing and the opportunity to win! Wow I LOVE AC products. 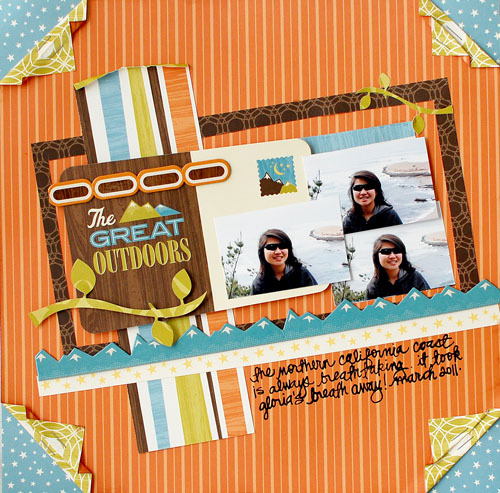 There cardstock is the ONLY one I use with my Silhouette machine and I LOVE their albums. I have come to hate the post bound scrapbooks and will ONLY buy ones with rings now and ACs are the BEST. THanks for some wonderful inspiration and a GREAT giveaway!! Love your layout (as always), and I miss seeing your posts!! Great LO!! Thanks for sharing and thanks for the chance to win! Sarah, love that layout! You always inspire me with your little details (loving the turned up corners on this one)! great layout! thanks for the inspiration and a chance to win. I miss seeing your posts too! Love this one with the fun happy colors. Have a great day my scrappy friend!! Great los Sarah! and heck yes I wanna win that! oh, this collection is so cute, and your layout is amazing!! Great design! Thanks for the chance to win! Great layout! Love the bright orange color but what caught my eye was the corners!! I love the folded corners with staples – gotta “scraplift” this idea! Thanks for sharing your wonderful, cheerful layouts! I do! More importantly your layout has inspired me to work with oranges and browns, my least favorite colors. Thanks! I LOVE your layout! I love the Campy Trails line and what you did with it! Wonderful! I really like Campy Trails. I’m going to have to find some paper. Thanks for the chance to win such a wonderful prize! Oh, I love that layout and those fun colors. 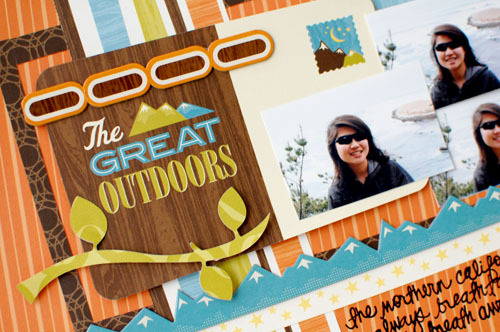 Just spotted one of your layouts in my latest Creating Keepsakes magazines. I believe it was a skyline theme. Anyway, fun! Thanks for the giveaway. Oh my gosh I’ve worked with that kit before and it’s awesome! Love your layout, Sarah! Thanks for sharing! Wow what a colorful layout…and great color combination…thanks for sharing this and the chance to win this fav candy!!!! am definitely ready for warmer temps to get here! Love the way you folded all the corners to show the different papers!! What a great LO! Colorful and FUN! Super cute layout! I really like what you did with the corners! Oh wow, I love it, I love it, I love it! i especially like the cute corners! Fabulous layout…love the bright colors! Thanks so much for the chance to win! Love your layout, the corners look beautiful! Thank you for the inspiration, ideas and great giveaway :)! Love the color combos on this!!! Such an adorable LO!!! Love the colors and patterns, the diagonal, and the corners! Looks great. Hope you feel better soon. Campy Trails has such great bright colors! I’m loving everything I see made with this line! Thanks for an awesome giveaway and a chance to win it! Your work is SUPERCUTE! I love the titled photograph block! It’s really a great idea! Love the site! SUPER cute page Sarah!!!! Love Campy too! ;D You really inspire me! I don’t have to hop on for inspiration, I found it here. Wonderful layout! Love orange and blue!! Great combo. Would love this album kit! Thank you for your inspiration! I love AC !!!! thanks for the chance to win ! I love your layout. Thanks for the inspiration. I’ll try to do a page with orange and blue. I hope I’ll be lucky just for once. Love that colour combo. Stunning layout. Why of course I want it!!! LOL!!! What a wonderful giveaway! I just love your layout it is just so CUTE!!! How you tucked the corners is my favorite! Oh, love your page!! 🙂 And how cool is that album kit?? Eeek! My fingers are crossed! I love how you put a bit of a tilt in your design, really nice! love the color combo! orange, yellow, blue! who knew! Love the orange and blue combination. Thanks for the chance to win! I LOVE this! What you did with the corners of the page is so great! Fantastic! Cute layout! Loved your corners, very cleaver!!! Love this line! Fun, fun page! Love how you did the angled pics and the folded corners. Thanks for sharing – and thanks for the chance to win! Love everything about this layout – the turned-back corners, the eye-popping combination of orange and blue, and the slightly tilted angle of the center pictures – well done! Love the campy trails and the great colors! Thanks for sharing! oh, its all just too cute! I’ve missed your scrappy pages Sarah! I love how you folded and stapled the edges of your papers. Such an adorable technique! Super fun design on your layout! LOVE it! supercute lo! I love this line! I love the bright orange! Thanks for sharing! i love this layout! perfect use of the line. I would LOVE to win. I love your outdoory layout. How adorable your page is!! You did a GREAT job. It’s really cute! Oooooh…I want it!!!! Love the colors you chose!!! Love how you folded the corners of your layout and the blue paper with the stars. Great line. Thanks for a chance to win. Love your layout and blog. Thanks for the chance to win. Happy St Patricks Day! First time to your blog. Fun layout. can’t wait for summer! Loving what you are all doing with the Campy Trails line. Awesome page! Like your page. Thanks for the chance to win such a great product. Wow, a gorgeous page, and a fab give-away! Love how you’ve folded the corners of the papers to show underneath, brilliant! Love orange and blue together!!! Great layout! I really love Campy Trails and can’t wait to get some! thanks for sharing ur fun layout! and i would so love to win some AC goodies! 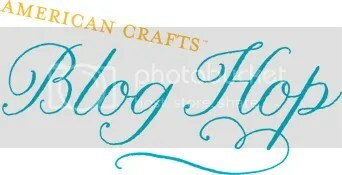 Love the colors in your layout:) Great giveaway as well, gotta love a blog hop! It’s GREAT camping weather here. Soon it will get hot so I think you have perfect timing! I am in LOVE with Campy Trails!! Love this LO! Love the colors of this LO…thanks for the giveaway! Orange is one of my most favorite colors, it is such a happy fun color! I love your layout, thank you for inspiring me! And I just talked to my sister about needing an album and she recommended this type so oooohhhhh heres hoping I get lucky! Thanks for the fantastic chance! love those corners!!! terrific lo! love the giveaway and the hop! Very cute, love the Campy Trails line! Thanks for the chance to win! wow que de couleurs !!! j’adore ca fait du bien apres un hiver froid!!! I LOVE how you did the corners on the page – and can not wait to try that! Looks like an awesome line. Thanks, as always, for the inspiration. love your color combi on this one Sarah! Glad you’re feeling better! Love what you did with this new collection. The tilt to the photos and the torn back corners and the photos are fabulous! What an amazing giveaway, good luck everyone! Love how you did the corners. Luv this line and your page! Thanks for sharing! Love the layout & the kit! Thanks for the chance! That is seriously becoming one of my favorite lines! I need to get some. 🙂 Love your layout! Love your LO! Thanks so much for a chance to win the awesome prize! Love how you folded your corners. Great layout! LOve your sweet page!! Thanks for the chance to win this awesome prize!! fun giveaway…and your layout is adorable, as always! Love your layout and love Campy Trails! LOVE the campy line!!! Great layout!! You are so generous ! Thanks a lot ! I adore the page and the prize!!!! Wow!! Love the folded corners!! Wonderful layout!!! Great layout, love what you did with the corners! I’ll be “borrowing” that idea. Great giveaway! Lovin that layout with the Campy Trails papers, I may have to lift some of that, I picked up those papers last week and haven’t had a chance to use them yet. glad to see you’re back in your creative groove! happy crafting! Great layout! I didn’t like the line when I first saw it, but seeing it on your page, I think I’ve changed my mind about it. Thanks for sharing! Ooh that orange is wonderful! I really get a kick seeing all the different ways the team is using the products. Your layout is seriously fun! I love the way you created the corners. Inventive and a great way to frame the main part of the LO. Thanks for the giveaway! J’aime beaucoup ces couleurs que je n’aurais peut être pas osés ! Le cadeau est magnifique, merci ! Great colours and I love how you turned up the corners; so prefect for double-sided papers! Very cool pics, too! I LOVE what you did with the corners!! That is so super cool!! Got to get my hands on this line!! Love the LO. Campy trails is such a versatile line. Thanks for the chance to win !! Just fab!!! love those colors and thanks for the chance!! I love your layouts, I always do. Just in case you pick my name, feel free to draw another one. I have that kit already. Love the layout… Thanks for the chance to win such a wonderful prize! Love your layout -so very nice!